It is hard to describe Hinges: Clockwork City, even when you have read it a couple of times. This is because it feels different. For one, its graphics play a big part in leading you into the tale. Of course, pictures play a big part in all graphic novels (it is, after all, a graphic novel), but Hinges…seems different. You have to study its picture frames and, like a rat, sniff your way through its unique setting to understand what is happening and what the characters are up to. Dialogues are kept to the minimum. Descriptions are non-existent. As a reader, I love this refreshing approach. 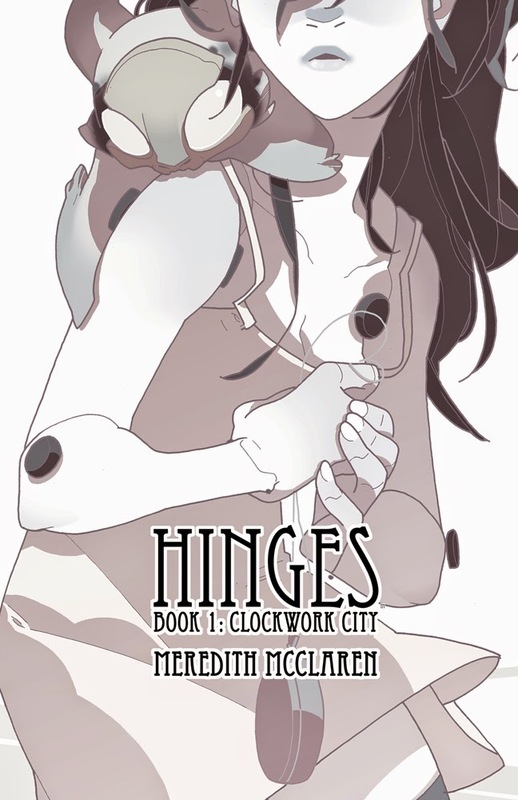 Hinges: Clockwork City features a doll called Orio, and her companion, Bauble, in a city full of dolls like herself. Like most of the dolls in the city, Orio is given a list at the point of existence and handed over to a caretaker, who will help her settle down and get a job that fits her list. Orio, however, does not fit into the instructions or traits on her list. She and Bauble exhibit behaviours outside of what is prescribed for them by the organisation in charge of the city. Also, the city (which, by the way, is named Cobble) seems to be reacting to something and acting funny with strange creatures coming alive. There are weird workings afoot in Cobble and Orio is being drawn close to its centre. Hinges: Clockwork City is a graphic novel for all ages. Most of the art is in sepia tone, which lends an eerie feel to the story (some might say it looks cyberpunk-y). Dialogue is used sparingly in Hinges and the art made to do the talking. Where the book shines is the story setting, which is rich and potentially expansive, laying a good foundation for the story and whetting the appetite for what is to come in Book Two. All in all, Hinges: Clockwork City is a fine addition to its genre and worth a punt. Hinges: Clockwork City is written by Meredith McClaren and published by Image Comics (March, 2015). Its paperback version is available to buy from Amazon.